A smooth smoked and poached salmon pâté. 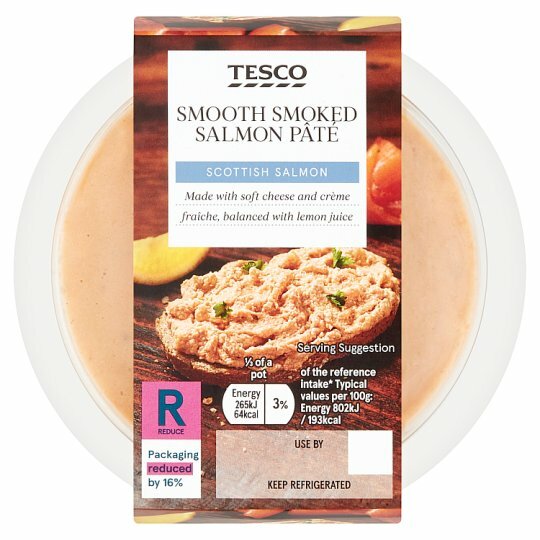 Tesco Smooth Smoked Scottish Salmon Pâté 100g. Made with soft cheese and crème fraîche, balanced with lemon juice. Smoked Salmon (25%), Single Cream (Milk), Poached Salmon (15%), Water, Full Fat Soft Cheese (Milk), Rapeseed Oil, Crème Fraîche (Milk), Lemon Juice, Olive Oil, Tapioca Starch, Pasteurised Egg, Tomato Paste, Spirit Vinegar, Salt, Horseradish, Cornflour, Black Pepper. Smoked Salmon contains: Salmon (Fish), Water, Salt, Brown Sugar. Poached Salmon contains: Salmon (Fish), Salt, Brown Sugar.